Indicate which days you are able to attend on the next page. Please spell your name as you would like it to appear on your name tag. All workshop attendees should also supply the organizers with 2 slides for the rapid PICO self-introduction session on Monday. Dinner for the workshop attendees is covered, but additional guests (spouses, family) will need to pay on their own. The fourth Open Science Data Cloud (OSDC) international workshop funded in part by the NSF Partnerships for International Research and Education (PIRE) program in Amsterdam will gather young researchers and experts to discuss challenges and solutions to the growing wealth of data in all scientific fields. Participants from North and South America, Japan, and Europe, will engage in talks, hands-on tutorials, and lively discussion. We are looking forward to the workshop as an opportunity to develop new insights, new understanding, and lasting international research collaborations. Some of the events will be at the Faculty of Science, UvA (904 Science Park, Amsterdam). Casa 400 is located close (approx. 3 minutes walk) to the Amsterdam Amstel Station. From the Amstel Station, bus no 40 departs every 15 minutes and takes you to the Science Park in approx. 7 minutes. The bus stops to get off are "Science Park" or "Science Park Aqua". Twice an hour a train goes from Schiphol to Amsterdam Science Park directly. Or take the train to Amsterdam Central Station and from there take the train (Sprinter) direction Almere-Oostvaarders / Lelystad Centrum and get out at Amsterdam Science Park Train Station. 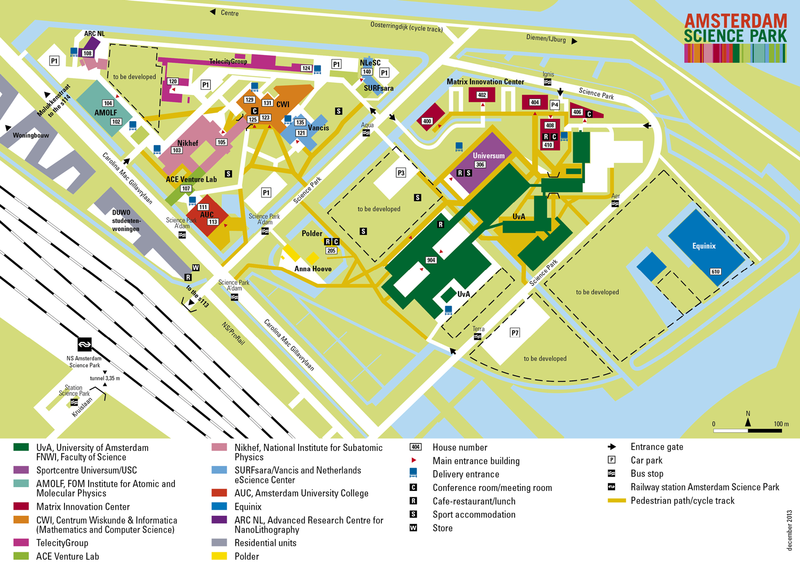 By Taxi from Schiphol Airport: Depending on traffic, a taxi can take you from Schiphol to Science Park in 15 to 30 minutes at a cost of about 50 euros. By Uber from Schiphol Airport : https://www.uber.com/cities/amsterdam to UvA Science Park cost from 20-66 euros. In order to help us with the organization we ask that you note each day you will attend the workshop. Please also indicate whether you will attend the Boat Trip, Dinner, and/or Museum Trip by selecting 1 ticket for yourself. You will also have the opportunity to bring one or more guests by indicating the number of extra tickets you will need. The guests are not covered by your registration and the economical cost will be decided at a later date. Introduction to big data challenges, community solutions, and the OSDC. Dealing with Big Data around the world: on-going research at OSDC PIRE host institutions. Technology topics of general interest. Research project development in breakout sessions. The System and Network Engineering (SNE) research group focuses its research on emerging new local and wide area optical networks and the associated models, systems and protocols. The group builds tools and proof-of-concept applications that promote optimal use of these high speed networks, and develops grid middleware to empower applications to optimally allocate and use these infrastructures. Security of the required mechanisms, infrastructure, middleware, applications and the privacy of data in distributed processing environments is an essential aspect of the research. The research group works closely together with the SNE Master and the Computer (Grid) Science Master programs to disseminate knowledge through education. System and Networking Engineering is one of the groups in the Institute for Informatics of the University of Amsterdam. See the Research and Projects pages for a listing of the main research lines and current research projects of our group.